Dried shiitake mushrooms keep at room temperature indefinitely, making them an attractive year-round alternative to fresh mushrooms. For most preparations, you'll need to rehydrate dried shiitake mushrooms first, then use them in whatever dish you are making. Dried shiitakes are delicious in pasta dishes or added to soups. You can also top a nicely grilled steak with reconstituted shiitake mushrooms. Shiitakes are high in B vitamins and protein, making them a healthy and tasty food to keep on hand. Place 1 oz. of dried shiitake mushrooms in a medium-sized bowl. Bring 1 1/2 cups of water to boil, then pour the hot water into the bowl to cover the dried mushrooms. Let the mushrooms sit for 30 minutes while the water plumps them and reconstitutes them. Drain the mushrooms using a fine mesh strainer set over a large bowl. Use your fingers to squeeze excess water out of the mushrooms. 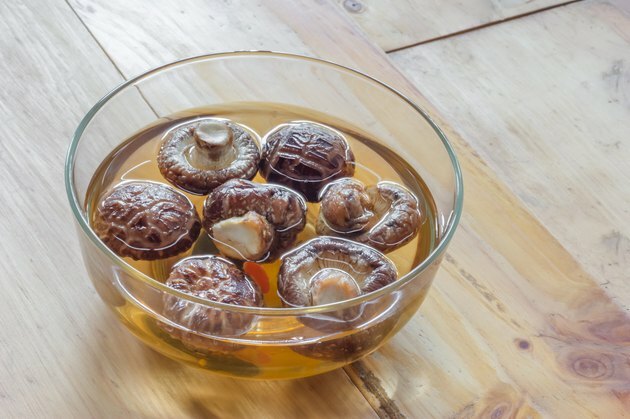 Reserve the mushroom soaking water for use as a broth in any soup dish. Slice the shiitakes with a chef's knife, discarding the stems if they seem tough and chewy, and add the mushrooms to your favorite pasta dish or soup. Or pat the shiitakes dry with paper towels, then saute them in butter and serve them on top of a hot, juicy steak. Dried shiitake mushrooms double in size when properly rehydrated. Don't go out and pick wild fresh shiitakes on your own without help from a mushroom expert. Some wild mushrooms are very poisonous.